So did any of you stay up and watch the Lunar Eclipse last night? It was awesome. We lucked out here in North Texas and had a very clear night. On the cool side. I didn't have to go out side to watch. I could sit in my chair in my computer room and watch it out my window for most of it before it moved across the sky and our trees started getting in the way. I watched the beginning but then decided it wasn't up staying up later than normal for and that I'd probably be able to see it online It was really cool but I was tired, LOLOL. Ditto. I went to bed watching NASA TV channel. Woke up a few times and saw it each time at a different phase. It was very orange-red! (From the reflection of the sunset and sunrise on earth, they say.) Was quite pretty. Too cloudy at our house last night to see it outside. We lucked out and had a really clear night. It was really late here so it had to even later for you Brandi. into small, medium or large. I bought a dollar, squirt gun, and it leaks, that is to be expected. I need on with a rubber plug, anyone know where I may buy one? We had the freeze here last night. I am not sure I have seen a squirt gun with a plug. But my guess would be to go to a Toys R Us or toy store they should have all their summer stuff out. And have a large selection to choose from. TBM how is the broken arm doing? That's wonderful news. I am sure it's healed. Kids heal so much faster than us older folks do. too cloudy here to see the Blood Moon -- I had set my alarm -- bummer! Had snow/ice on ground this morning -- yet another bummer. Good news -- they family is all for doing the sunrise baptism! yeah! Yikes Sister more snow & ice. It was really early morning for you. Most of the time when we have these things it's to cloudy for us here. Yeah the family will do the sunrise baptism. We had snow last night, may have a freeze, tonight. If you water your plants or flowers, it helps keep them from freezing. I believe, I gleaned that information from the weather channe,l a few years ago. I am sorry, I do not know why or how it works. Thank-you for addressing the squirt gun for me. 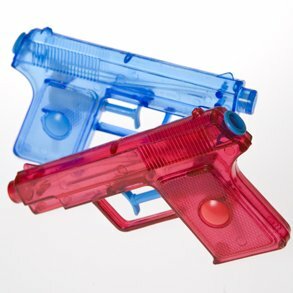 I checked out a few places and all I found was giant sized water squirters, or el cheapo plastic water pistols. But, Brandi, found one or a two pack, LOL. Thank-you, so very, very much for your excellent research on water pistols. I am grateful for the rubber stopper. I will send for them, soon, and let you know how well they work. Perhaps, we can have a squirt gun battle, in the monkey playground.